Well, February was a slow month around the house. Being sick for a week and then having to say goodbye to our sweet Boo really took it out of me, so after starting off the year with such an amazing and productive January, February was a real let down. But I still managed to get a few things done. The biggest accomplishment was finishing the hallway. 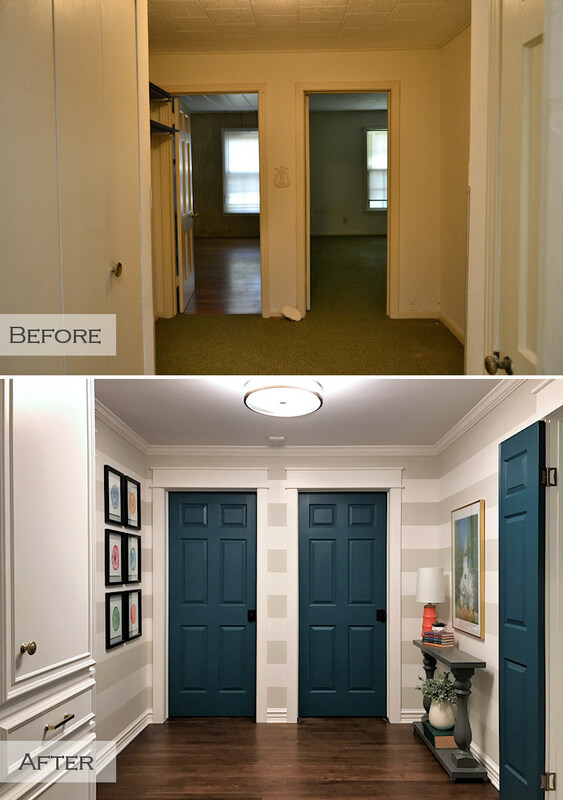 You can click here to see more before and after pics if you missed it. It’s felt so nice having one more area of the house finished. My brother and I also got a lot accomplished on the front porch. Even though we didn’t actually finish anything (so nothing can really be crossed off of my master list), I’m still including this in my list of accomplishments for the month since it was a pretty big project. 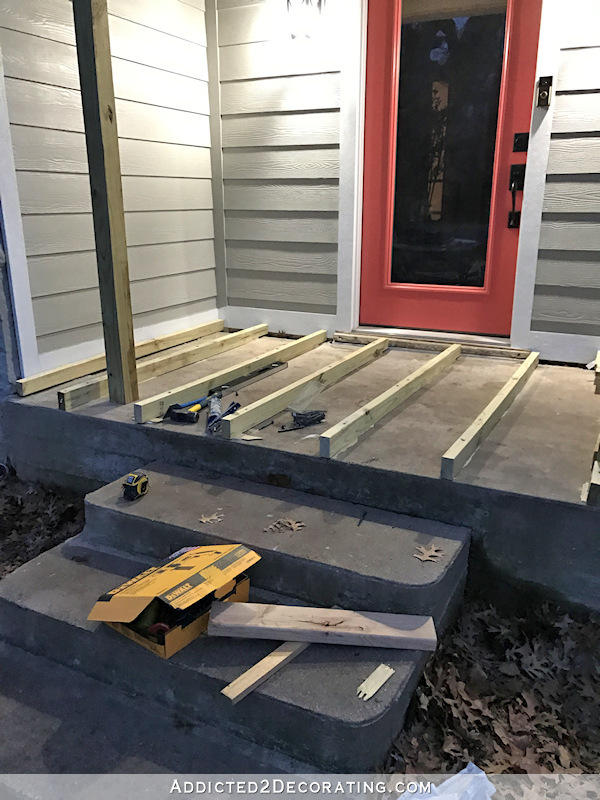 We got all of the risers in place so that I can now install the porch boards on the front porch. That was quite the project, but after a few missteps, we finally figured out the right way to do things. You can read more about that here and here. I ended up taking the pressure treated pine porch boards back and exchanging them for untreated cedar. That way I won’t have to wait months to stain the porch floor, and the wood is prettier to begin with. It did end up costing about 2.5 times the amount of the pressure treated pine, but I think it will be worth it. 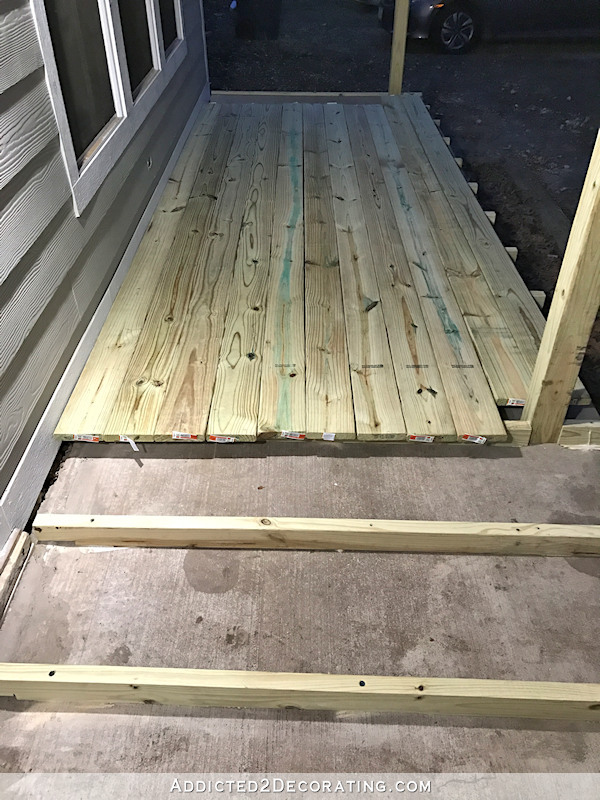 Unfortunately, the weather here has been so rainy that I haven’t made any more headway on the porch after we installed those risers. But today, I’m actually seeing sunshine, and the temperature is supposed to be in the low 70s, so today just might be the perfect day for working on the porch. And that’s pretty much it. Wow. Talk about a slow month! …and you can click here to see more details if you missed it. But I still need to figure out how I want to frame it so that I can get it finished and hung in place. …so it’s time to get those finished. Y’all know I’m not really one for plain, solid drapery panels, so naturally I’m going to add a little trim to the edges. Well, I’m actually going to be adding trim to the top, the bottom, and the leading edge of each panel. I have a plan and a vision. 🙂 That’ll slow down the process some, but I anticipate the end results being very well worth the extra effort. …and I opted for cedar instead. And the columns will be wrapped in wood and trim to give them a more traditional look. I’d love to say that I’ll also finish the new steps and the hand rail, but that might be a bit too ambitious. We’ll see. I’m still trying to find an electrician to do the wiring for me, and I already have my insulation and drywall guys lined up to get the job done as soon as the electrical is finished. I’d love to be able to start on flooring and trim by April. So those are the big picture goals for the month. Hopefully I can squeeze in some smaller fun projects along the way. March is a longer month, so you have that going for you! 🙂 Sounds like a great list! These will all be major things to cross off. Keeping my fingers crossed that all goes well. You will be so glad you changed to the cedar . It has that deep warmth that your house needs against the gray and white. You can get the warmth with stain on the pine butthe green undertones of pressure treatments is always there. Kristi, you really have gotten a lot done despite adversities. Good for you! You know, your latest creation is going to look great on your fireplace. So interesting, but it doesn’t overpower the subtle colors in the rug. Kristy, in your living room, is that a real fireplace? 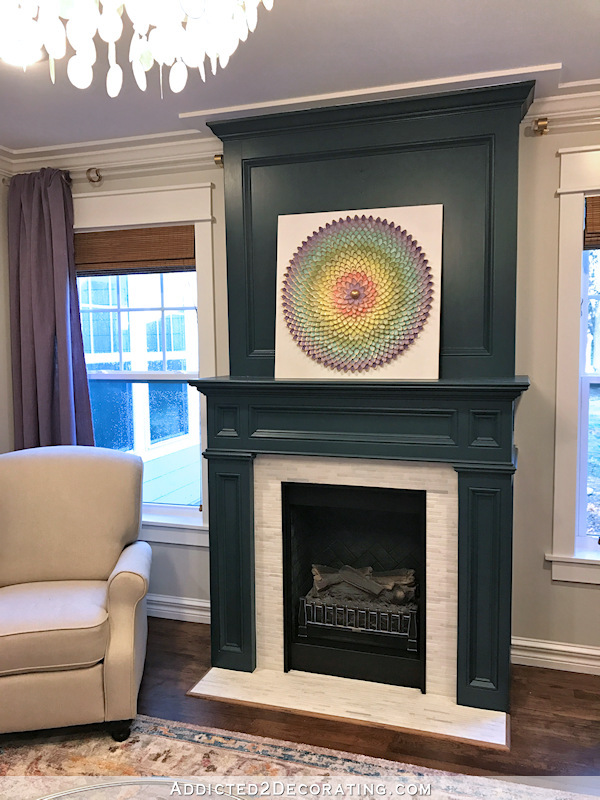 Did you take a fireplace mantel and make it look like a real fireplace? She made the whole thing!! Everything!! You are too hard on yourself. Your worth is not measured by how much you get done silly. You got things done in spite of it all. Glad you are feeling better. That workroom is going to be awesome! Make sure you wire the room for speakers for music inspiration. This is something I regret not doing!!! Ceiling speakers and an integrated Sonos system will do wonders for creativity! Don’t want to be a Debbie Downer, but hope you’re not sorry with the cedar. It is a rather soft wood in comparison to pressure treated. Here in Ohio, we had some solid cedar porch posts rot out at the bottom as well as cedar railing, and I paint every other year, so it wasn’t that they weren’t protected. Maybe you have a dryer atmosphere there, but I wouldn’t do it again. The spoon art is fabulous, BTW. Oh – and the porch is only 15 years old and well taken care of. So sorry to hear about Boo. Fur babies are so special and they are missed when they’re gone. Glad you are feeling better, and that the weather is cooperating for work on the porch. You really have gotten a lot done in the month of February, though it may not seem so right now. Dividing the jobs up by month can make it seem as if not much got done, but you’ve made good progress on both the porch and the living room. I like the frame on the Houz artwork you posted, maybe that would be a good one for your artwork over the fireplace? Something simple that won’t compete with the beautiful colors and form of the art. Looking forward to seeing what happens in the month of March! Onward and Upward! Um, you forgot to put pantry on your list (says me waiting so I can replicate what you do in my own home). I was thinking the same thing. An-tic-i-paaaaa-tion. 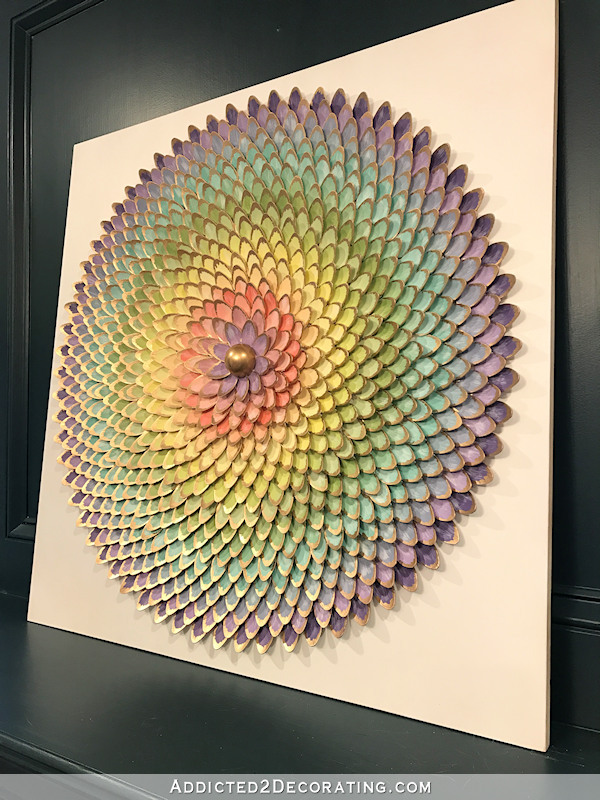 I think you still accomplishment a lot with finishing the hallway and what you have already done on your font porch, let alone your gorgeous one of a kind pinwheel artwork. Really looking forward to following your March progress with the porch, columns and your living room drapes. I’m loving your new artwork! I can’t wait to see it framed! I’m so sorry about Boo! It’s so hard to say goodbye to our fur-babies. You are incredibly talented. I’m just amazed every time I see a finished room. Your hall looks better than my entire house! Absolutely everything you do is beautiful and so creative. How long did it take you in total to do the pinwheel? I’m trying to figure out if I have the stamina to finish it!! It’s definitely time-consuming. 🙂 I pretty much poured myself into it (and Netflix) for three days. If most of your readers are like me (just a regular person, lol), they’re thinking you accomplished a lot in February! It’d be nice if you could get outside and work a bit after being sick, sad and stuck inside. We all have months or sometimes years like this. At the Nut House we are finally getting to the window trim in the living room. We installed the windows years and years and…..years ago. Posting the pictures on instagram has been a bit of a surreal experience after waiting so long to get here. I’m getting addicted to check things off the list. Despite the setbacks of your health and losing your beloved pet, I think you accomplished a lot. Besides February is a pretty short month. 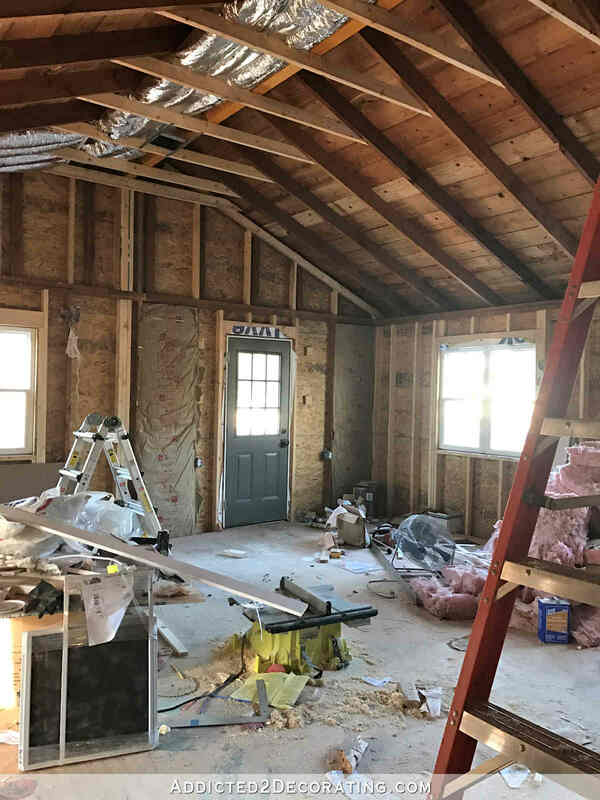 You’ve got a longer month coming up and sounds like you have some great goals as you finish your living room, the porch floor and get started on the studio. You are an inspiration to all of your readers. Don’t be so hard on yourself as you accomplished a lot in January and February. March will be great and hopefully, the weather and your health will be good and help you out.